Sportscast Productions (Oklahoma City): a sports promotion and broadcast production firm founded in 1968. Sportscast Productions provides on-site broadcast promotion services for national sporting events -- including 20 NCAA Division 1 championships, PGA TOUR golf events, U.S. Olympic Trials, professional hockey and many others -- ranging from radio feeds to satellite television reports. The firm also produces television and radio syndicated programs. John Brooks, president of Sportscast Productions, accepted the 2000 National Broadcast Sports Program Award sponsored by Coca-Cola and Powerade for a series of shows on Oklahoma Football and where the collegiate stars are today. Pictured above are two members of the Sportscast Productions team at the Shell Houston Open. 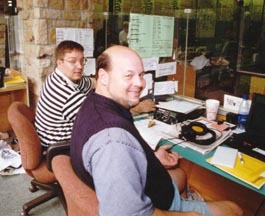 For almost 20 years, the broadcasters have provided stories and interviews that resulted in more than 30,000 on-air radio broadcasts during each four-day event. Send mail to vinson@solutionscompanies.com with questions or comments about this web site. Copyright © 2006 The Creative Group of Solutions Companies.